Good Candy P, the 2018 Ruidoso Select Yearling sale topper for $340,000, was purchased by leading buyer Don Cavenaugh . RUIDOSO DOWNS, NM—SEPTEMBER 3, 2018—For the first time since 2014 Ruidoso Select Yearling Sale shattered the $15 million mark in gross sales. A strong catalog with great individuals fueled a vibrant market that saw increases for gross, median and average price topped by a son of champion sire Good Reason SA purchased by leading buyer Don Cavenaugh for $340,000 in the sales' closing session Sunday night. Ruidoso reported 323 yearlings were sold for $15,032,000, up 14% over last year's $13,208,500, with the $46,539 average representing a 7% gain over the $43,307 in 2017. The median of $29,000 was up 4% from last year's $28,000. There were 61 horses that went unsold and 29 horses out. The Sunday night session averaged $51,739 per horse (sold), a 12.2% boost over the final night of the 2017 sale. There were 30 six-figure yearlings $100,000 or over, 13 at $200,00 or more and two yearlings broke the $300,000 mark. Don Cavenaugh paid $340,000 for Hip 326 Good Candy P, who sold Sunday for $340,000 on behalf of Lazy E Ranch, LLC, Agent, for Michael Pohl. The sale-topper by champion/champion sire Good Reason SA is out of the stakes winning track record setting Pyc Paint Your Wagon mare Paint Me This Wagon, a half-sister to champion All American Futurity winner Jess Good Candy. Cavenaugh also purchased the second high-seller a $300,000 colt by leading sire Apollitical Jess in the opening session Friday night. Roger Daly, Agent for Allred Bros. Ranch, LLC consigned the Hip 130, A Sweet Jess, out of the Grade 3 winner One Sweet Dash, by First Down Dash. A Sweet Jess is a half-brother to six black type including AQHA Racing world champion and champion sire One Dashing Eagle and Grade 1 winner and leading sire One Sweet Jess. 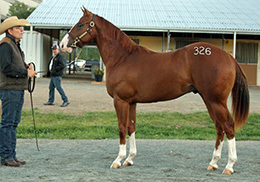 This is also the family of leading sire Walk Thru Fire. Longtime Quarter Horse owner R.D. Hubbard, paid $257,000 for the sale's third high-seller, Hip 210 Jess Helene. Lazy E Ranch, LLC, Agent consigned the son of leading Mr Jess Perry from the Rainbow Futurity(G1) runner-up Belle Helene by Valiant Hero. Jess Helene is a half-brother to stakes-placed 2-year-old Maghelene. Jess Helene's second dam is the Rainbow Futurity(G1) winner Thewayouwantmetoo, dam of four black type including champion 2-year-old A Revenant. Reliance Ranches, LLC paid $230,000 for the sale's high-selling filly, Hip 321 Jessafamouslady. Grants Farms, LLC consigned the daughter of Mr Jess Perry from the multiple Grade 1 finalist Famous Corona Lady, a half-sister to champion and leading sire One Famous Eagle. Jessafamouslady is a sister to Jest Famous, third in the 2018 Rainbow Futurity(G1). The aforementioned Don Cavenaugh was the sale's leading buyer with four purchases totaling $830,000. Reliance Ranches, LLC had five for $759,000 and R.D. Hubbard paid $589,000 for four head. Lazy E Ranch, LLC, Agent, for McColee Land & Livestock was the leading consignor and agent with 12 head grossing $1,388,000. Lazy E Ranch, LLC, Agent had another 22 head for $1,312,500. MJ Farms, Agent was the third leading consignor with 20 head grossing $846,500. Mr Jess Perry was the sale's leading sire (by average, two or more sold) with 25 yearlings averaging $97,240. Good Reason SA had 10 for $80,700 and Apollitical Jess sold 25 head that averaged $68,920. Champion Kiss My Hocks with the leading first-crop sale sire with nine yearlings averaging $61,444. Champion Hes Relentless was second with 14 yearlings averaging $28,071. For preliminary results for all three sessions, including hip-by-hip results CLICK HERE. Final results will posted on StallioneSearch when the Ruidoso Horse Sale Company releases them.